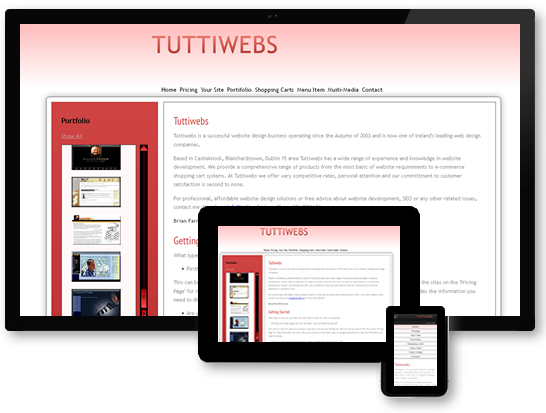 Tuttiwebs regularly maintains websites for its clients and will regularly update sites on a daily basis. If you prefer to have us do this rather than you having to train in staff or yourself in learning how to use a content management system, Tuttiwebs will be more than happy to discuss this with you. Should you already have a branding along with colour and logos we can easily incorporate this into a new website so that the theme is kept consistent throughout your business. This is always dependent on how quick Tuttiwebs receives the content (texts, images, etc.) that is to go on the site. Once all the detail is gathered most small business sites can take around 10 working days to complete. This is something that can be discussed during initial consultation as there are many factors that can affect this. Search engine optimization or SEO for short is an area that can cause confusion amongst most clients. Often we get asked ‘How do I get my site up to the top’ in a search facility and although this is a very common question however, there are many factors that can affect this. Firstly Tuttiwebs always build sites with strong home page text content which is vital in getting indexed by the various search engines. Page ‘titles’ (very very top of the browser window) are always added to the head of page and reference the content on the page where appropriate. Content headings within the main body of the web page are carefully placed on pages where design allows so that search engines can access these in a specific order as the page loads. We always register sites with the likes of Google for example and always add a ‘site map’ to help with ranking and search optimisation. After this we usually recommend you wait for a certain period to see how the site performs then adjustments can be made if the site is not performing as well as expected. It’s important to remember that your product will have a substantial affect on how the site performs. For example, if you are selling coffee, then you must appreciate that by typing such a word into a search engine will return tens of thousands of results. So, it’s important to be realistic as to how well you expect your site to perform especially if you are in a very competitive market. If however after a period of time you’re not happy with rankings then it’s essential to talk to us as there are many many options we can look into to help improve a competitive area. Finally be very careful of SEO spam emails or cold calling calls that claim to be able to get you to No1 - nobody can ever guarantee this as it’s a complete myth. All packages are developed to suit your needs. You don’t pay for what you don’t need. Tuttiwebs will setup all the necessary hosting without you having to do anything other than discuss the content of your website. Tuttiwebs always tries to keep the technical detail to a minimum as most of the time it’s confusing to the client unless you have reasonable experience. So, basically when Tuttiwebs builds a site for you will automatically receive the following. Diskspace: Space where the site is hosed. Anti-Spam / Anti-Virus: All incoming mail is scanned for virus and spam. Databases: MySQL, PostgresSQL, MS SQL. Control Panel: to administer mail. Content Management System (CMS): Secure login to administer website content. Linux: The operating system that runs all of the above.